Teachers at my school have been using visual thinking strategies with students. It's a strategy that can be used with all ages, and the results are usually astounding. Here's how it works in a nutshell. Show students a photograph or painting, and pose the question: "What's going on in this picture?" As students respond, you may pose a follow-up question: "What do you see that makes you say that?" Teachers record students' responses and allow time for them to really dig deep and discuss what they see. You can read more about Visual Thinking Strategies here: http://vtshome.org/. Capstone has published a series that will elicit rich discussions during visual thinking strategies discussions. The Captured History series chronicles how specific photographs have had a profound impact on American history. Last year, Louise reviewed Migrant Mother which examined how Dorothea Lange's photograph prompted a public outcry for the government to send aid during the Great Depression. 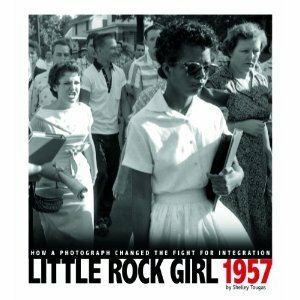 The most recent title in the series, Little Rock Girl 1957, focuses on the Civil Rights Movement and how a photograph of a high school student brought about changes in public opinion. The famous photograph (as seen on the cover) shows African American student, Elizabeth Eckford, followed by an angry mob of white people as she walks outside Little Rock Central High School on September 4, 1957. Elizabeth and eight other African American students, known as the Little Rock Nine, were supposed to meet and walk into the school together. It would be the first time African American students attended Central High School. Elizabeth arrived at school early and alone. She faced an angry crowd of protestors, and her entry into the school was blocked by National Guard troops. As Elizabeth turned to leave, protestors followed her down the sidewalk as they venomously hurled insults and racial slurs. Will Counts, a local photographer, took photos as the events unfolded. Shelley Tougas provides readers with background information including details about Brown vs. the Board of Education and Jim Crow laws. She also writes about the challenges the Little Rock Nine faced at school, and she provides updated information about the students and the photographer that drew attention to the racial hatred in our country. Tougas writes in a clear and organized manner that makes book accessible to young readers and photographs are effectively placed throughout the book. One photograph shows a female reporter shielding Eckford from the crowd as she waits for the bus. In another photograph three African American students eat lunch together in the cafeteria of Central High School while white students are seated around them at separate tables. I have to admit, I got a bit emotional as I was reading the text and studying the photographs. The most emotional photograph for me was a color photo taken in 1997. It shows Elizabeth Eckford with her arm around Hazel Bryan Massery as they stand in front of Central High School. Massery is the white woman seen walking behind Eckford in the famous black and white photo. Viewers of the photo can see she is visibly angry, and she's yelling at Eckford. In later years, Massery shared her remorse for her role in the 1957 incident, and Counts (the photographer) brought the two women together to meet in person. The back matter is impressive and includes a clearly organized timeline, a glossary, sources notes, and a bibliography. I'm planning to order the set of Captured History for my school library. There are so many possibilities for these titles. Students interested in history will scoop them up for independent reading, but they can also be used by teachers during history lessons. Other titles include Man on the Moon, Raising the Flag, and Breaker Boys. This sounds like a powerful book indeed. I'm hoping I can find this in our libraries. Thanks for bringing this book to my attention. It wounds wonderful and I love the idea of looking a the power of a single photograph to create change.